A large sundial stone base decorated with drapes and flowers with leaves. On the top dial face the large round sundial is bade in iron with scripted the roman numbers hours. The round sundial ficx with the round irons parts in the stone base. The general form of the sundial base was in the antique a baluster, round or square in section, plain or enriched with sculptured ornament. Have the 18 century origin. A sundial is always welcome in pleasure ground, not only as a distinctive ornament, but as a link with the old garden. Although in these days , when everyone carries a watch and when clocks are many, it has all but lost its original purpose, yet it is still pleasant in summer days to read the time by the sun on an old dial. Dimensions: Stone base height 32"; Iron dial face height 28"
Our proposals of garden furnitures include stone wells and sundials of ancient and timeless flavor. Garden stones carved entirely by hand, unique pieces made from rough blocks of Vicenza stone skillfully shaped by our sculptors to give form and life to your garden. 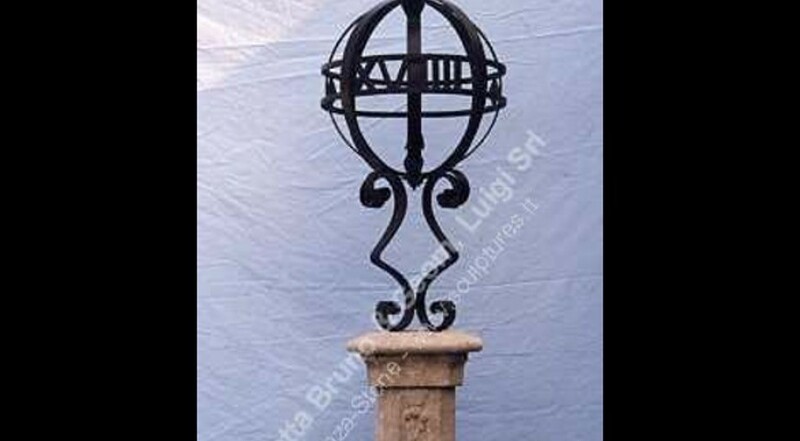 Garden decorations made with the typical white stone of the Veneto villas: stone wells, hand-decorated with iron pulley, and sundials with base sculpted in stone and bronze dial. Browse our realizations of wells and garden sundials which we propose below, wondering of secret corners of ancient and fantastic gardens with timeless stone sundials and garden wells, symbols of water and garden life.